It is the pride of Ladakh and one of the least explored 6000mt summits in India. 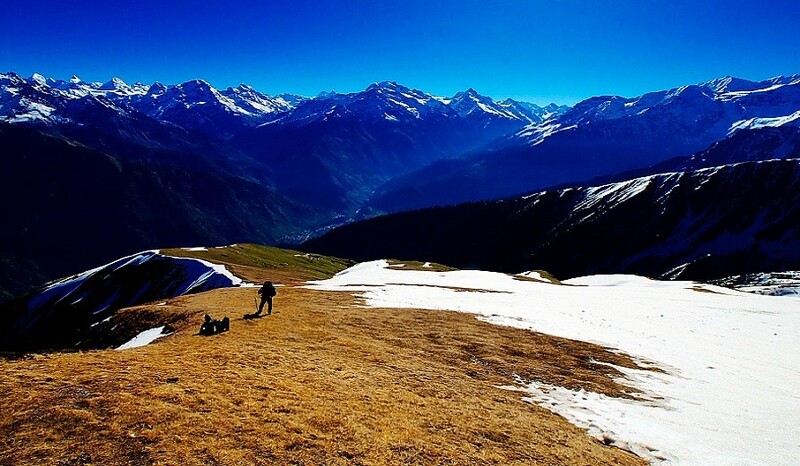 Be the one to join the elite club of trekkers to have conquered the 20000ft / 6000mt peak. Being at 20K Ft it is still considered as an easy peak as this peak does not require technical skills. This route has been uniquely designed to approach the summit from one side and descend from the other. Route taken by us in this trek is very unique and the entire route is filled with green pastures, high oxygen availability with a entry from one side and exit from the others. With this approach you will not have to repeat the route along with MUCH BETTER VIEWS of the valley. Leh is the headquarter of Ladakh. It is located on the banks of the Sind (Indus) river, between the Khardungla and the Stok ranges at an elevation of 3250 meters. There are various early morning flights to Leh from Delhi. You can come by Road to Leh from Manali or from Srinagar. After arriving check into the hotel. There will be an introduction and a briefing session in the evening. This day is to prepare your body for the higher altitudes. The day will be spent acclimatizing around Leh and making permits. We will climb the small hills around this town. First, we will go to the Leh Palace, which is a little above Leh overlooking the town. Above this is the Tsemo monastery from where we have a magnificent view of Leh. After that, we will visit the Shanti Stupa. The evening will be spent in making last-minute purchases and packing our backpacks for the trek. The day of the trek is here. Make sure you have all your essentials for the climb to the top. We start our drive towards Stok village, which is across the Sind river. Its a half an hours drive to the village. Stok village is famous for it's Royal Palace. This place has lots of greenery and wheat farming is done here.We start our trek from here. We walk along a stream for some time, and then there is a moderate climb for an hour. The landscape is pinkish and barren. Changma is flattish place ideal for camping. Overnight stay in tents. Today's trek is a trail through barren landscape and valleys. The views of the steep cliff shaped mountains are breathtaking. The topography appears pinkish. There are plenty of blue sheep in his area. They can be seen easily on steep cliffs. Today is a total ascend and we gain approx. 1100 feet of altitude. There can be signs of nausea or mild headaches. You can be free to talk to our trek leaders, who are trained for these kinds of situations. Mankarma is an ideal campsite along a stream. Overnight stay in tents. Today we will walk along a wide valley for some time, then climb along a ridge. The ascend is normal to moderate. There are lots of water bodies on the way. The base camp is located at around 5000 meters. It is a wonderful place to set up camp. This place is cold, but not too windy. After reaching we occupy camp, which will be in tents. After lunch, we will go for a short acclimatization walk towards Gulab Kangri. Then in the evening, there will be a short briefing session and a medical checkup in which some vital information about High altitude sickness will be discussed. Today is the day for packing, training and briefing sessions. A climb to a peak has a certain level of technicalities involved which have to be adhered to with a certain level of discipline. There is a big glacier on the way, so you should have the knowledge as to how to walk on a glacier. Our trek leaders are highly qualified from prestigious institutions so you can totally rely on them. We will check all our equipment are in order. The rest of the time will be spent exploring the place. It will be an early dinner and you should sleep soon because it's an early departure tomorrow morning for the summit. Keep your clothes and sack ready so that you do not waste time in the morning. We get up as early as 1. A.M. Get your backpack ready. Put on your headlamps. Be careful to fill-up your water bottles, and keep them inside the backpack to stop them from freezing. We start by walking up toward the right. The trail is clearly visible from the camp. There is a steep ascent in the beginning, and then it gets moderate just before the glacier. It takes about two an half hours to reach the glacier. You have to traverse across the glacier. Take care while doing so as there are small crevasses here. As you cross the glacier the visibility also increases as the day breaks. You climb along a ridge, and then another ridge. The climb is steep. Then you come to a rocky patch. From here it is a walk along the final ridge. You may have a Vertigo effect during the final push. The snow is deep here.The trail is too narrow and every step has to be taken with caution. There is the effect of altitude also, so it is a slow progress. It takes about 8 hours to reach the top so you should be on the summit at about 8 A.M. The top is a small flat patch with lots of prayer flags fluttering in the air. 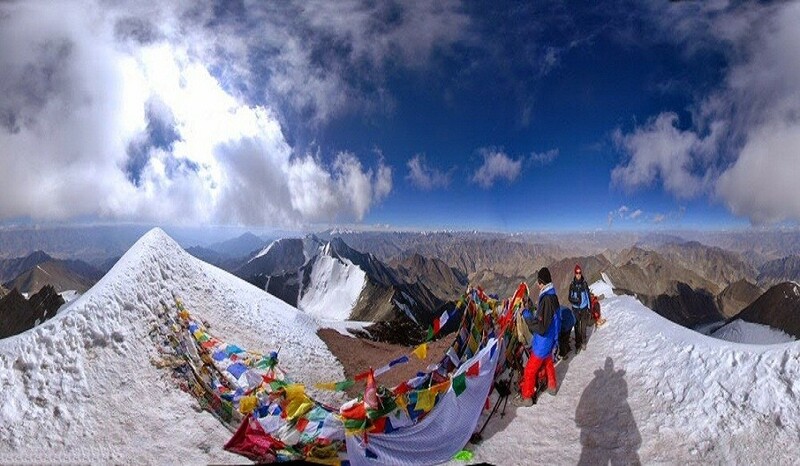 The view from the top is awesome, Khardungla pass can be seen much lower. You can see the Karakoram ranges as far as Mt K2. Stok Kangri peak dominates the skyline. It is said that on a clear day if you are lucky enough you can see Kailash Mansarovar lake. The entire Leh town can be seen from here. To the south, you can view the Zanskar ranges. After tying our prayer flags and clicking some photographs, we start our journey back. Be cautious while descending. The snow patches can get slippery. While coming back, click some photographs on the glacier. You reach back to the base camp tired and hungry and deserve a well-earned rest. Time has come to bid farewell to these amazing mountains. After breakfast, we start descending towards village Stok through the camps of Mankarma and Changma. Jeeps will be waiting for us on the road. From the village of Stok, you will drive back to Leh. Check in to a hotel. Time to have a hot shower and rest.Its been a long and a wonderful journey. it's time to bid goodbye. Board your morning flight from Leh to back home, or drive back through Srinagar or even adventurous Manali highway! It is very important that you line the inside of your bags with a big polythene sheet. Doing so will ensure, that in the event of rain, even though your bag may get wet, your clothes will still remain dry! transportation from Leh to Stok Village and Back.